Found in grassy areas and disturbed ground, Melanoleuca graminicola is a small, brown Melanoleuca that lacks the distinctive harpoon-like cystidia found on the gills of most species in the genus. A microscope will thus be required to identify it--and if you decide to forego microscopic analysis and simply call your little brown specimen "Melanoleuca melaleuca" I can hardly blame you, since many North American field guide authors have probably done the same. As a result, Melanoleuca graminicola is not featured in North American Melanoleuca literature--with the exception of a treatment by Gillman & Miller (1977) that was later (1995) revised as Melanoleuca angelesiana--a larger species apparently limited to association with conifers in the western mountains. 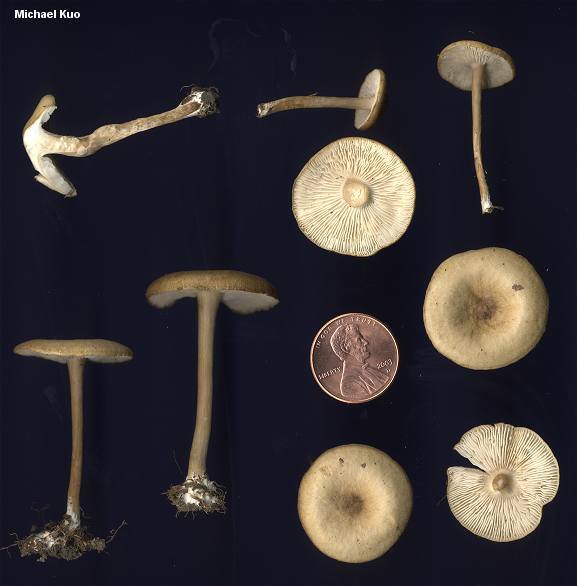 However, the European concept of Melanoleuca graminicola is quite clear, and consistently represents a grass or disturbed ground species with a small, brown cap and no cystidia. The illustrated collection is from central Illinois, and matches the European species perfectly. I suspect that Melanoleuca graminicola is common and widespread in North America, but consistently identified as "Melanoleuca melaleuca." Ecology: Probably saprobic; found in grassy areas and disturbed soil, often in urban areas; summer and fall; North American distribution unknown (see above), but possibly widespread. Cap: 2-3 cm across; convex becoming flat, usually with a shallow central bump, even when the margin becomes arched to create a central depression; smooth; dry; the margin long remaining curved under; dark brown, fading to brownish. Gills: Attached to the stem, usually by a notch; crowded; white, developing slightly pinkish hues. Stem: 4-5 cm long; up to 4 mm thick; firm; more or less equal; dry; whitish to tan; with tiny whitish fibers. Odor and Taste: Odor not distinctive or pungent; taste not distinctive. 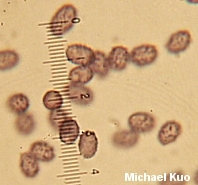 Microscopic Features: Spores 5.5-8 x 4.5-6 µ; more or less elliptical; ornamented with amyloid warts. Pleurocystidia absent; large, projecting cheilocystidia absent. REFERENCES: (Velenovský, 1920) Kühner & Maire, 1934. (Moser, 1983; Breitenbach & Kränzlin, 1991; Hansen & Knudsen, 1992.) Herb. Kuo 09040302.